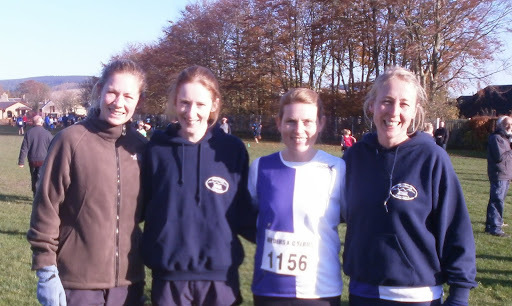 Really great start to the Borders Winter cross country series at Lauder on Sunday. Gilly, Rachael, Bill, Mike, Sarah & myself were blessed with beautiful weather that seemed to make running round a real XC course with stream crossings and a very muddy hill climb an absolute pleasure! The course was well marshalled and marked – many thanks to the organisers. All of us enjoyed it and Sarah did us proud by finishing 3rd lady, but all pleased with our achievement. Hilary was there with gorgeous baby Rory and Holly, great to see her back racing! Dunbar in 2 weeks time for a wee run along the beach and back through the woods – another great course. This entry was posted in Photos, Race Reports. Bookmark the permalink. Susie’s right – great course, well marked, encouraging marshals and superb weather. Congratulations girls; you all ran really well and what a great comeback race for Sarah. I’m also looking forward to Dunbar.